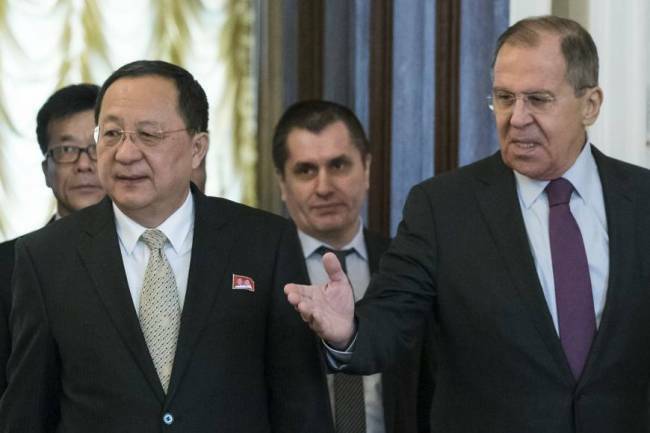 MOSCOW -- North Korea’s foreign minister held rare talks with his Russian counterpart in Moscow on Tuesday, as Pyongyang moves to improve strained ties with its neighbors. Ri Yong-ho’s visit came ahead of planned summits between the North’s leader Kim Jong-un and the presidents of South Korea and the United States in the coming weeks. Russian Foreign Minister Sergei Lavrov welcomed Ri to Moscow on Tuesday morning, saying that “Russia is as inclined as ever to develop good neighborly relations with North Korea”. His North Korean counterpart said he hoped for further “development of our relations” in comments translated into Russian. After the meeting, Lavrov answered questions from journalists alone, saying the ministers “examined in some detail” the nuclear situation on the peninsula. “The Russian side confirmed that we welcome gradual normalization of the situation, an end to mutual threats and readiness for contact between the two Koreas as well as between North Korea and the US,” Lavrov said. He said that upcoming talks should aim at denuclearization of the Korean peninsula, but stipulated that Pyongyang must also receive “cast-iron guarantees” of its security. He added that he had accepted an invitation for a return visit to Pyongyang, without giving a date. Alexander Vorontsov, a specialist on the Koreas from Moscow’s Oriental Studies Institute, said it was “particularly important (for Pyongyang) to enlist support, including from Russia, to cover its back” before further summits. Ri visited Beijing last week for talks with his Chinese counterpart, after North Korean leader Kim made a landmark trip to Beijing last month. On Monday, Ri met the head of Russia’s security council, Nikolai Patrushev and on Thursday is set to meet the Kremlin’s envoy to far eastern Russia, Yury Trutnev, Russian news agencies reported. Moscow has backed United Nations Security Council resolutions over Pyongyang’s nuclear and ballistic missile tests. North Korea currently has some 35,000 of its nationals working as laborers in far eastern Russia, particularly in timber felling, agriculture and construction.